Coming out a year after the HP-65, the HP-55 didn't generate quite the same level of excitement. It had no card reader and only 49 lines of program memory. (And, of course, a much lower price.) However, it did have more than twice as many storage registers (R0-R9 and R.0-R.9), more pre-programmed functions and a quartz controlled timer. 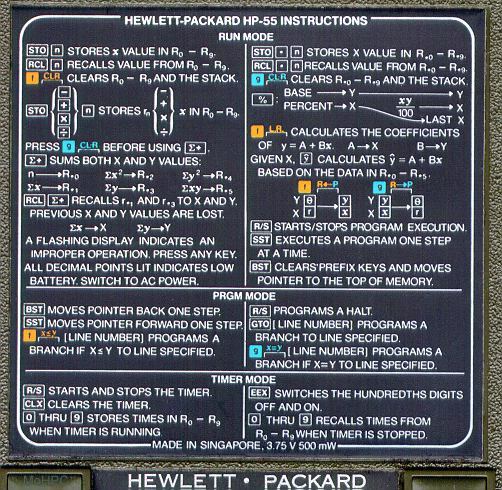 The timer was first officially introduced on the HP-55. 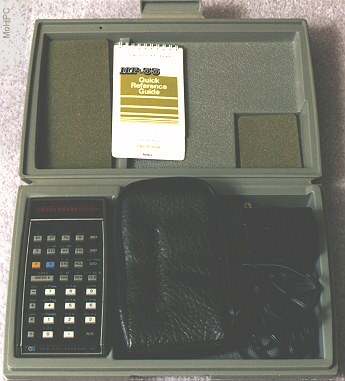 (Early HP-45s had the timer function without an obvious way to access it. They also lacked the quartz crystal to make it accurate.) Timer mode was engaged by a switch (Timer/Prgm/Run). Once engaged, the timer could be started or stopped by pressing R/S, cleared by pressing CLx, and the current time could be stored in any of the 10 registers by pressing 0-9. (When the timer was stopped but still in timer mode, pressing 0-9 recalled the stored times.) The EEX key toggled the hundredths digits on and off. The timer was well integrated into the calculator. When switched out of timer mode, the memories still contained the stored times in HH.MMSShh format. (Hours.Minutes/Seconds/hundredths.) Time calculations could be done directly with the H.MS+ and - functions, or times could be converted to/from decimal hours. 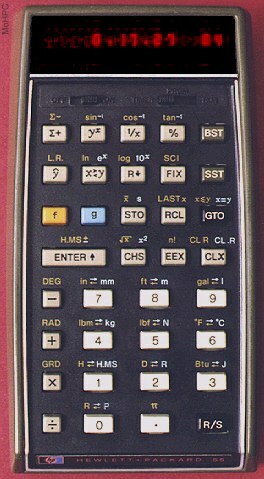 The HP-55 had more conversions than previous models. 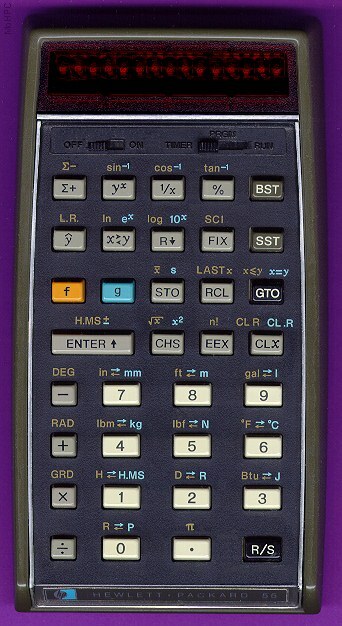 Unlike the HP-45, the HP-55 performed conversion functions rather than entering conversion constants. The conversions were in<->mm, ft<->m, gal<->l, lbm<->kg, lbf<->N, F<->C, Btu<->J, H<->H.MS, D<->R, and R<->P. The introduction (titled "Versatility Is Everything") tells the reader to start the timer. It then goes on to explain the functions of the calculator including the timer ("Did you know that most electronic calculators posses many of the ingredients necessary for a digital timer? The HP-55, however, has added a very small quartz crystal to provide an accurate time base. 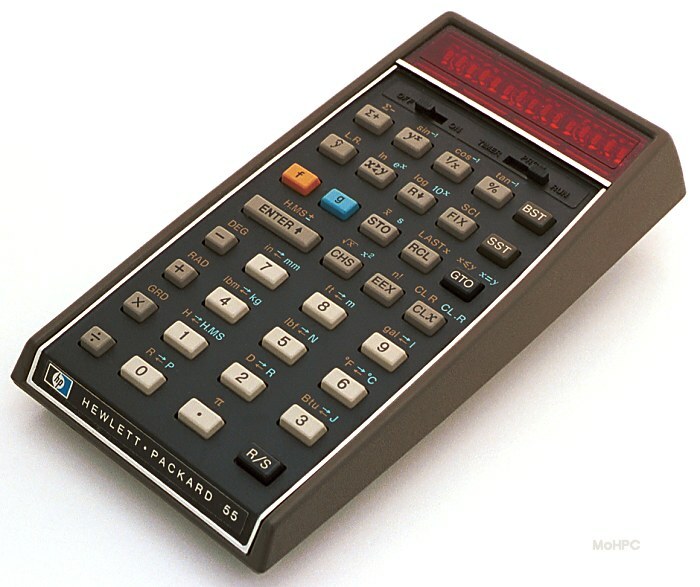 "), programming, editing, the fact that the HP-55 has more pre-programmed functions than any other calculator etc. At the end of the introduction, the reader is instructed to stop the timer. The manual then tells how many words are in the introduction and instructs the user in how to determine his or her reading speed in words per minute. Timer Mode (~41K) Display shows Hours.Minutes.Seconds hundreds of seconds. HP-55 in its travel case (~33K) The case also contains the soft case, quick reference and charger.